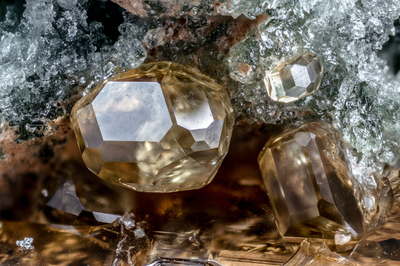 On a matrix consisting of pyroxene "fassaite", green in color, we can see in the upper right hand corner of the picture a perfect, small, light brown crystal of vesuvianite, with equal development of faces, while at the center of the picture a crystal with distorted faces for a different development of the same. Collection and photo by Gianfranco Ciccolini. Nikon D750, bellows, Luminar 25 mm.